With the most up to date trouble shooting diagnostics and the veteran knowledge of our skilled mechanics, Baldwin's German Autowerks team is confident undertaking any auto repair service your German vehicle needs! We do all auto repair- from the "check engine light" to transmission rebuild, and anything in between! 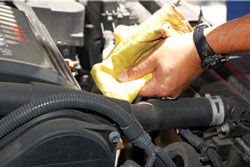 We provide the same auto repair and maintenance services with top-of-the-line tools and technology as the dealerships, however, the difference between a dealer & Baldwin's German Autowerks is the honest interaction with the office and technicians who are willing and very capable of assisting all German car owners.